The picture above shows how most fields were sown with seed for thousands of years. 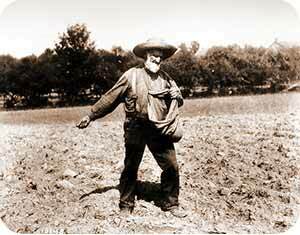 This farmer, as they did during Medieval times, and as they did during the first century, is taking handfuls of seed and just flinging them. With no machinery and many acres of land to work, this method may be wasteful but is the only hope the farmer has in getting the job done. If he took one seed at a time, the way you or I might in a small garden, and placed it gently into the soil one or two inches before moving on the next seed, he would still be planting in October when the ground froze. He’s wasting a lot of seed; this “broadcast method” of sowing seeds is inefficient in terms of how much seed is used per acre, but absolutely necessary if one ever intends to finish. The seed must be sown during the window of opportunity. This is the kind of sowing Jesus was talking about, the only kind his audience had ever known. Later, thanks to the industrial revolution, we could afford to be much more deliberate with our sowing. Jethro Tull’s seed drill, for instance, simply needed a goat or mule to pull it, and it precisely deposited one seed ever 12 – 18 inches, planting each one an inch or two into the soil. You had to buy the machine, but it paid for itself in that amount of seed it would save over it’s lifetime. No more tossing out your crop as bird seed. How deliberately precise are we about when and where to share the gospel? The gospel is free, and there should be no concern about wasting it. Consider a few examples: a teen spends a summer raising support to go on a mission trip. This church youth might spend weeks raising funds and promoting their trip. They buy a passport, airline ticket, luggage, and then fly around the world. Now, the work being done may be important. Perhaps they help a missionary dig a well, or aide in handing out vaccines. They read to third world children and share the gospel for one week. But look at all the strategic planning that went into this effort. Weeks of time and energy – and thousands of dollars – were spent to make just a few personal encounters possible. We could bring the examples home by analyzing our own church services, or perhaps personal evangelism outside of the church. In Jesus’ Parable of the Sower, seeds are being flung in every direction. The sower trusts that God will allow some of them to grow. How often do we rely on our methods to ensure growth? Paul said that one plants, another waters, and God gives the increase. We need to fling the gospel, as often as we possibly can in every direction. The Good News cannot be wasted; it was freely given to us, and so is the command to freely give to others. Carefully planning for weeks on end to strategically place a few gospel words in not what Jesus had in mind. This entry was posted in Christianity, Jesus's Example, religion, Theology and tagged Good News, gospel, Jesus, parables, seeds, sower, sowing seeds, spread the gospel. Bookmark the permalink. We were in Bayse Virginia a few years ago and went a Lutheran Church there. The gospel msg. was the Parable of the Sower. We were exhorted by the minister to “wastefully” share Jesus with the world. I like that verse in the bible,but I prefer the Sermon on the Mount better.I think that it is refering to the Kingdom of Christ.I take the Post-Millennial view on the KIngdom. Thanks for you comment Mike, sorry it took so long to appear. I’ve actually started teaching a series on the Sermon on the Mount. I’ll try to share that on The Master’s Table soon. Most of what people know about Jesus’s teaching is from the Sermon on the Mount.